The Poor Little Rich Girl is the last of four Mary Pickford films being screened as part of “Mary Pickford and the Invention of the Movie Star,” an exhibit dedicated to the silent icon (and Toronto native), currently running at Toronto’s TIFF Bell Lightbox. The exhibit is located on the fourth floor of the Lightbox, in the new Canadian Film Gallery, and features some 300 items, including photographs, posters, memorabilia, postcards, and products endorsed by Pickford, assembled over a 30-year period by private collector Rob Brooks. It’s curated by Sylvia Frank, Director of the Toronto International Film Festival’s Film Reference Library and Special Collections. TIFF Bell Lightbox screens The Poor Little Rich Girl this Sunday, January 23rd, at Noon. The series also includes Rebecca of Sunnybrook Farm; and Sparrows; screened January 15th and 16th respectively, and Daddy-Long-Legs, screening January 22nd. 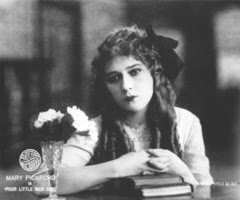 Though Mary Pickford’s career didn’t take off until her late-teens, she’d spend much of it playing children. Her fans accepted her in these roles because they didn’t need realism to suspend their disbelief—just a consistent, honest evocation of youth they could see through the guise—and Pickford usually delivered. In The Poor Little Rich Girl, she doesn’t, quite. 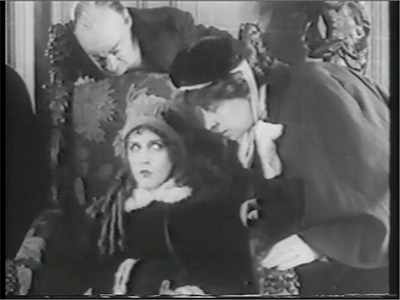 Its heroine, Gwen, is a mystery not only to other characters in the film, but to Pickford herself. Her performance is uneven; oddly so from a pro like her. So odd that I think you should see it happening, and judge for yourself. You may end up siding with poor Mary against her own script, as I did; for I believe it did her no favours. Gwen (Pickford) is the only child of a wealthy businessman and his prominent wife. Her home is also her playground and school, and she has no friends. She’s treated delicately, though she’s clearly robust. Her daily routines are absurd and dictated by paranoia: she has to plead even to take a walk. “Don’t blame Jane if the kidnappers get you,” snaps a servant. Gwen’s mom and dad are bad parents because they’re too wrapped up in their own lives, or so the film suggests, early on. But I think they’re bad because neither they, nor the guardians they hire, understand what their daughter’s about. “Everything her heart could wish, and she isn’t even grateful,” one of them grumbles, as though Gwen is a brat. She’s not a brat. She’s smart and thoughtful; polite, fairly obedient; rambunctious, but never cruel or destructive. She’s presumed to be worse than she is, and treated accordingly. Maybe that’s a fair mistake, though? The single child of indifferent, very rich parents; sequestered from other kids her age and waited upon by servants who both defer to and detest her—shouldn’t this little girl be a monster? Did marketing demand an angel instead? A more volatile Gwen might garner less sympathy from audiences. She’s the sole heir to big money, after all. Clearly I didn’t buy it. I wasn’t certain who this Gwen was. I wasn’t even sure, until well into the film, how old Gwen was supposed to be. Here, as in many of her films, Pickford appears alongside much taller actors, performing in oversized sets. But the scale seems inconsistent. And Pickford herself seems unsure of Gwen’s age: her performance reminded me of a child about six, and Frances Marion’s script backs that up, basing several scenes around Gwen’s inability to grasp metaphors—the sort of misunderstanding a six-year-old would have. But the movie later confirms that Gwen is ten. Would she be that dense? The script also pours it on too thick, even by Pickford’s standards. Lines like “Daddy, haven’t you time to love me a little?” and “Why do my to-morrows never come?” may have you reaching for something other than a tissue. But things improve, so to speak, in the third act, when Gwen is accidentally poisoned, very nearly killed, and in the course of her treatment drifts in and out of consciousness, seeing everyone around her as they really are. Her clothes change to rags; her mother, prone to ‘burning the candle at both ends,’ now tends a vast field of them. Her father, who’s ‘made of money,’ now hunches at one end of a large machine that spits out bills. The depictions of the servants are grisly. A ‘snake in the grass’ literally becomes a snake. Another—the ‘two-faced’ one—rotates through scenes showing a face on either side of her head. This stuff is more Pan’s Labyrinth that Pickford-esque, and overly potent for The Poor Little Rich Girl, but I wish the film had more of it. A lot more. Redemption follows the macabre, as it often does in the movies, but your willingness to forgive Gwen’s parents will depend on whether you can believe they truly love her, just because they are parents. Not because they’re her parents, but because they are parents. Like a lot of silent films, The Poor Little Rich Girl presumes the existence of certain universal values, possessed by all, but ignored by those whose preoccupations or bad habits have blinded them. Once they’re enlightened, all is righted. This is shaky thinking to post-modern audiences, who tense up when called upon to accept the inherent goodness of a thus-far faulty human being. “I know I shall never find happiness, without my mother and father,” says Gwen, delirious in her bed. No summation of Gwen herself could be so simple. Though there is one shot that might do it: the one that begins Gwen’s series of hallucinations. 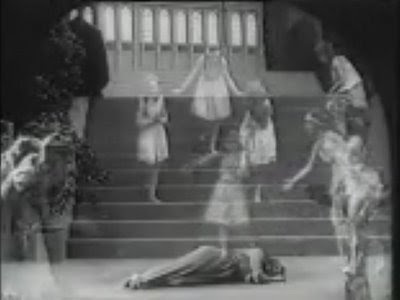 Stoned on sedatives, Gwen spins and teeters on the top step of a tall staircase. It’s a precarious thing, being unsteady and up so high—it feels precarious even to us, and then the camera begins to rock, and it’s as though we’ve lost our balance too, with nothing below us but a long drop. In that moment, Gwen looks like we feel. So does Mary Pickford. I saw both POOR LITTLE RICH GIRL and THE HOODLUM recently when TCM (US) aired each as part of a retrospective on the history of Hollywood and filmmaking. I agree with you the former is filled with an abundance of ambitious storytelling motifs (and somewhat odd given the time period). I was able to suspend my disbelief because I find Mary Pickford’s scene presence charismatic and her intuitive acting style flawless (besides I just plain like her). However, when I compare her rich girl to the hoodlum, the first film (as you said) really did not do her any favors. 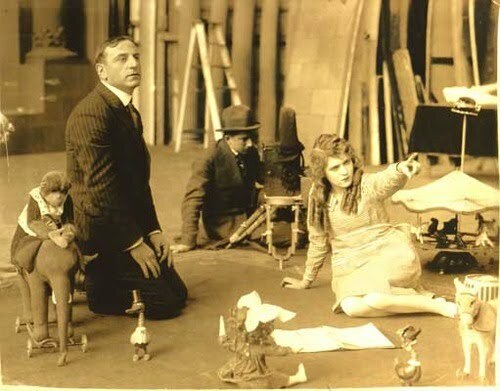 I would still recommend both films to anyone interested in the art of silent cinema, along with TESS OF THE STORM COUNTRY, as proof of Mary Pickford’s well-deserved reputation as one of the era’s screen luminaries. Thank you for sharing your evocative and perceptive review. Thanks for reading. I haven't seen The Hoodlum, but did write about Tess--the link is at right. It's not a favourite of mine, but like you, I'm fine with Pickford's performance in it. Caught this one on TCM recently. I liked it!